Basically what happened here was Blue Note records asked Madlib to come on in and freak whatever they had archived over the last 64 years or so and this is what he came up with. Straight up JazzHop. The original LP (single disc) is out of print. 2014 brings a deluxe double disc vinyl re-issue! 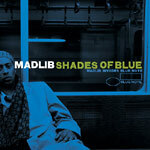 Produced and arranged by Madlib.